we’ve had such cold and rainy weather here for weeks, it feels more like autumn than summer. the urge to knit warm jumpers rather than thin and airy summer thing is overpowering. it’s a good thing that my present wip is knit up in merino wool, albeit a short sleeved little thing. it is a slow knit, however. i’ve been very good and kept myself to this knitting for weeks now and i am making progress, but not as fast as i’d like. the knowledge of the fact that i will have to re-knit the entire back is also a bit demoralizing. my fingers are itching to start a new project. but i really want to see this jumper finished, too, so i think i’ll be able to restrain myself from casting on. which would be the first time in history, probably. yesterday was the annual world wide knit in public day and my plan was to join up with my knitting group, sthlm knitters, for some public knitting in the centre of stockholm at mariatorget, but alas, we were again forced inside due to the cold and rain. 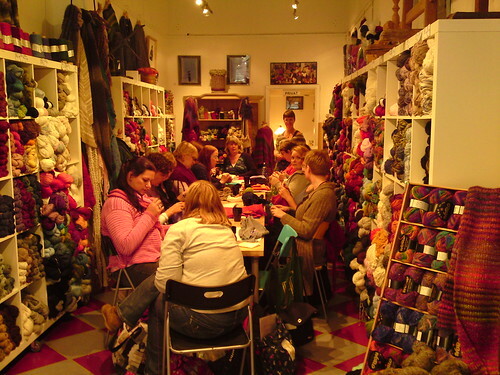 luckily, maria – proprietor of the excellent yarn shop marias garn – gave us space and coffee at her shop. we had a wonderful day but were all sad about being forced indoors. june can be beautiful in sweden, but too often also rainy.